Email not displaying correctly? You can view it in your browser. On Wednesday. Christmas Eve. Before three o’clock. Get your redflower on at 20% off. It’s a gift for you. You can only get it here. Smell it here. Feel it here at HighStreet. Snacks and a Serious Sale. 10am until 4pm (open until 6pm). Merry Merry. Happy Happy from HighStreet! 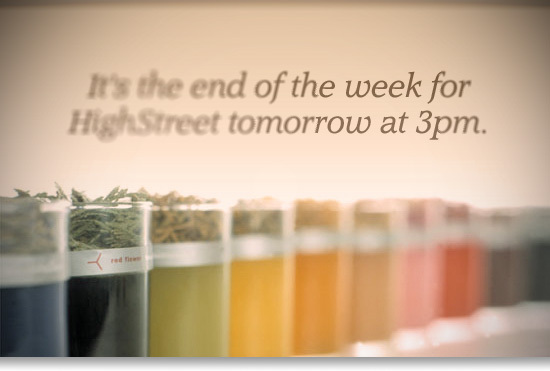 Follow our new blog at highstreetblog.com. Find out more about us at highstreetcincinnati.com. Copyright (C) 2008 HighStreet. All rights reserved.